Product prices and availability are accurate as of 2019-04-19 00:38:36 UTC and are subject to change. Any price and availability information displayed on http://www.amazon.com/ at the time of purchase will apply to the purchase of this product. All the luese in our sets are heavy and big baits,so you can use long shot and they're suitable for different fishing environment as well. With sharp hooks, when fish once bite, it could not run away. Choosing the right bait for your rod is important, fishing is not easy therefore you have to use the best bait available! Eye: 3D stereoscopic eyes, more realistic and vivid. 1. Strong and sharp, like the real fish. 2. Not easy to be broken, can withstand heavy fish. 3. Anti-corrosion, durable and practical characters. 4. Easy to fish by barb hook. 5. The quality is very good, it experienced precision processing. Pack of 30/159/347/43/48 pieces Mixed Color and Size Fishing Lures Kits for New Fisher! When using this lure, please be sure to check the the safety of your surroundings. Please out of reach of children. The hooks are extremely sharp. Please handle with care. 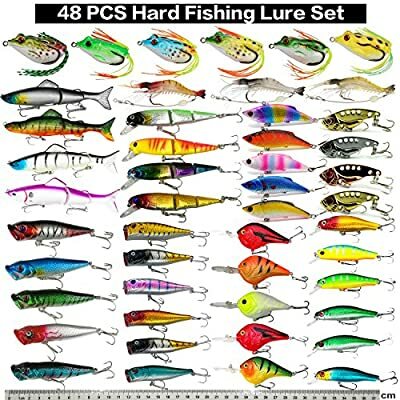 The shape and color of fishing lures maybe different or same, we sent them randomly.